A few days ago Kurt Baker played a special show for kids as part of the Ghost Highway Recordings 10th anniversary celebration. The show was packed and we had a lot of fun. We interviewed Kurt and chatted a little about kids, rock ‘n roll and gummy bears! 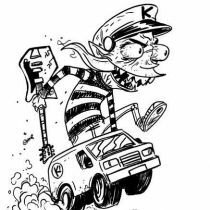 Kepi Ghoulie is the author of some of our favorite monster punk rock songs, first with his band Groovie Ghoulies and now as a solo act. He also made the super fun children’s record “Kepi for kids” and published an art book featuring his ghoulish paintings. His new album is called Lost and Lovin’ and is out via his own Kepiland records. We chatted a little with him and had some fun in the dark.